This guide is designed to be used as a ‘checklist’ of procedures to be followed each time that you run your payroll. You should follow these procedures in the order suggested to ensure that the RTI data sent to HMRC is accurate and complete. Please note that this is not a definitive list, but a ‘standard’ guide for day-to-day payroll. For more detailed guides on each specific task please refer to the Support section of our website. Make sure that you have entered the details of all employees that have joined or have left your employment since the previous pay period. This starter and leaver information is sent to HMRC as part of your next RTI submission. Sick pay, Maternity Pay and Paternity pay is all entered on the ‘Calendar’ screen. 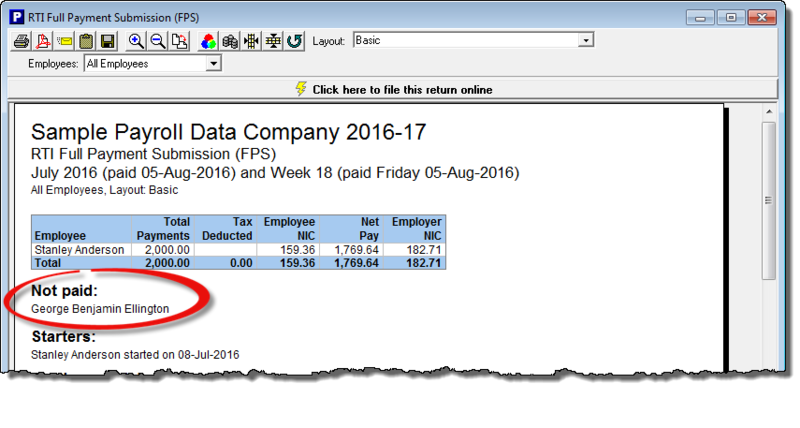 If you have employees that are due to receive statutory pay then check that you have entered up-to-date information by clicking ‘Employees – Calendar’ from the menu. Click on the button to show the ‘Employers RTI Schedule’ then click on relevant period. Check the RTI Full Payment Submission (FPS) report which gives details of all employees that are being paid in this period. This report also shows details of employees that are NOT being paid in this period, which serves as ‘double-check’ that you have entered each employees pay correctly. Click on the button ‘Click here to file this return online’ to file the FPS return to HMRC. Click ‘Pay – Employees Payslips’ and choose the employees that you wish to produce payslips for. Click the ‘All’ button to select all employees. You can then print or email the payslips as appropriate. Click ‘Pay – Payments – Payments Summary’ to produce a report showing how much each employee is to be paid. You can then make arrangements to pay each employee. We recommend that you make backups of your payroll data on a regular basis – it is good practice to do this each time that you run your payroll. Click ‘File – Utilities – Backup/Restore’ to see the various backup options.